The Andes in South America are the longest continental mountain range in the world. The Andes span about 7,000 km and run through seven countries: Venezuela, Colombia, Ecuador, Peru, Bolivia, Chile and Argentina. AirVuz put together a collection of the best drone views of the Andes for a unique aerial tour of this beautiful region. You'll see drone footage of Machu Picchu, Rainbow Mountain, Patagonia and Ausangate Trek. The Andes in South America are the longest continental mountain range in the world. The Andes span about 7,000 km and run through seven countries: Venezuela, Colombia, Ecuador, Peru, Bolivia, Chile and Argentina. AirVuz put together a collection of the best drone views of the Andes for a unique aerial tour of this beautiful region. Starting in famous Machu Picchu which is called the "Lost City of the Incas" and is known for its sophisticated construction. Then Rainbow Mountain (Vinicunca) gets its unique appearance from 14 different colorful minerals. You’ll see Salar de Uyuni, the largest salt flat in the world. Aconcágua is the highest peak in the andes mountains at 6,960.8 M. Cotopaxi is one of the highest and most active volcanoes in the world. The Patagonia region on the southern end of the Andes is shared between Argentina and Chile. The Ausangate Trek is a popular trail through some of the most visited sites in Peru and you’ll get a glimpse of it in this compilation. The Altiplano Plateau is home to lots of wildlife like llamas, vicuñas and condor. Palca Canyon in Golivia is an unusual area of tall, weathered rock formations. Finally, Atacama Desert is famed as being the driest, non-polar desert on earth. 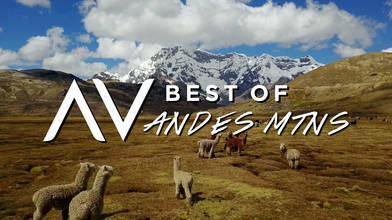 To watch the full collection of drone videos of the Andes Mountains region. CLICK HERE. “Andes.” Wikipedia, Wikimedia Foundation, 14 Feb. 2019, en.wikipedia.org/wiki/Andes. Velásquez, M. Tulio, et al. “Andes Mountains.” Encyclopædia Britannica, Encyclopædia Britannica, Inc., 26 July 2017, www.britannica.com/place/Andes-Mountains. Zimmermann, Kim Ann. “Andes: World's Longest Mountain Range.” LiveScience, Purch, 14 Mar. 2013, www.livescience.com/27897-andes-mountains.html.